The AccountMate Return to Vendor Authorization (RTV) module offers a comprehensive system that you can use to track returns of purchased items to your vendors. With it, you can create RTV orders, return purchased items and receive the corresponding substitute or replacement items. During this process, the system updates your accrued liability for received goods along with the on-hand inventory quantity. If applicable, you can assign a serial number or lot number to the substitute or replacement items you receive. 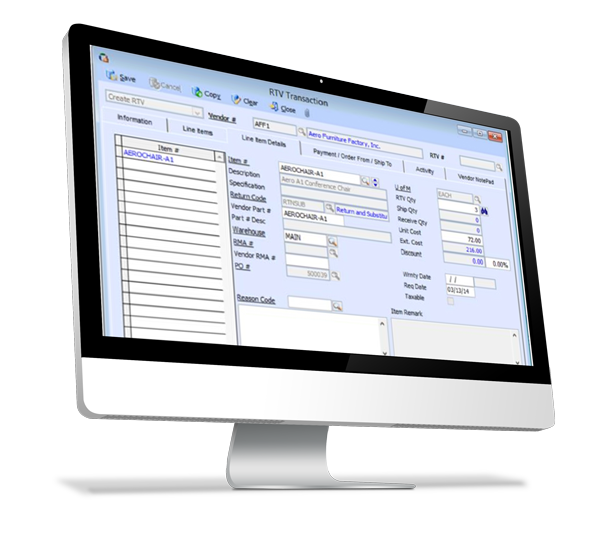 AccountMate computes any gains or losses that result from having the purchased items be replaced or substituted by the vendor. This module provides multiple return actions from which you can create unlimited return codes to represent all possible vendor return scenarios.